Remove the silver-skin. Unlike fat, it won’t melt away during cooking. Do leave any marbled fat on the meat, since that provides so much of the flavor. You can rub any spice mix on the surface of the tri tip before smoking it. Some people cover it in olive oil right before putting it in the smoker. Others will soak it in a marinade overnight in the fridge. If you want to apply a spice rub, remove it from the marinade first. You can use any smoker to smoke tri tip, since it is - at most a five pound cut of meat. You’ll want to put a meat thermometer in the meat to monitor its internal temperature. Heat up the smoker to 250 degree Fahrenheit before you put the meat inside. The traditional wood used for smoking tri tip is red oak. In reality, any hardwood can be used. Expect this process to take more than an hour or two. However, tri tip steak cooks in a fraction of the time brisket would. That would take around ten hours. If cooking a single piece of tri tip, expect it to be in the electric smoker for at least an hour. It typically takes an hour and a half. However, done depends on when it gets hot enough to be done. The meat will need to cook once the internal temperature of the thickest part hits 130 degree Fahrenheit. Once that happens, remove it from the smoker. You can wrap the tri tip in foil or butcher’s paper. If you want to keep it warm, put it in a cooler without ice. That will extend the cooking process, as well. What if you’re going to eat it immediately? Let the meat “rest” for about twenty minutes. Resting allows the juices to return to the center of the tri tip. Then cut against the grain into thin sections and serve with your favorite sauce. 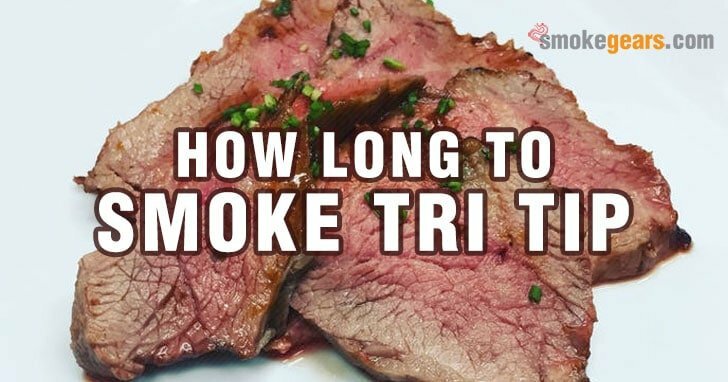 Tri tip is such a small cut of meat that you can smoke it on a grill. You could use the smoker box that came with the grill. If you don’t have a smoker box, you could make one from an 18” square piece of aluminum foil. In this case, add several handfuls of pre-soaked wood chips. Mesquite, hickory and oak work best. Poke a few holes in it to let the smoke escape as they burn. Heat up the grill to somewhere between 350 degree and 375 degree Fahrenheit. Sear the meat for about five minutes. Then turn off all the burners until a single one is on. The only exception to this is if you want to have rare or medium rare steak. In that case, heat up the grill, turn off all but one burner, and put the tri tip on. Put a drip pan under the grate of your grill. That catches the grease and prevents flaring. It should be over the cool burner. Now put your wood chips in the smoker box or smoker pouch. The smoker should be on the hot burner. After it catches fire, close the grill. When you smell smoke, place your tri tip roast over the drip pan. Then close up the grill so the meat can smoke. Flip over the meat every twenty to thirty minutes. The meat should cook until the internal temperature is 130 degree Fahrenheit if you want well done meat. If you want medium rare beef, remove it when the meat is at 125 degree Fahrenheit. Cover the beef with foil. Let it rest for ten minutes. Now you can cut up the tri tip at a 45 degree angle in quarter inch slices. You can serve the tri tip as is or with the sauce of your choice.